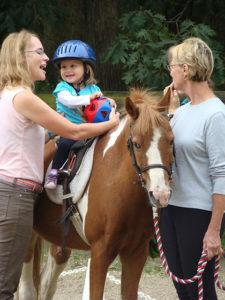 Since 1985 Wellspring Farm has offered a therapeutic riding program. Now called Hearts, Hands and Horses 4 H Club, it is a program for people with special needs, from children to adults. Like Wellspring Farm’s lesson program, a balanced seat is emphasized. Our therapeutic riding instructors have specialized training. Our horses are gentle, willing and safe. The facilities offer students an opportunity to enjoy all seasons of nature from the back of a horse. Once paperwork is complete, students in Hearts, Hands and Horses 4 H Club begin their initial riding lesson with a Therapeutic Riding Instructor and an Occupational Therapist. An individual plan is developed for each student with consideration for their particular needs and goals. All instructors and volunteers are insured through 4 H. All participants join 4 H and are eligible to participate in statewide 4 H activities. All volunteers and participants are insured through The University of Delaware Medical Insurance in connection with the 4-H.
For people who may benefit from Occupational Therapy Wellspring Farm offers hippotherapy which is the use of the movement of the horse as a treatment strategy by Occupational Therapists, Lauren Janusz and Brooke Zuvich from Brandywine Occupational Therapy LLC. Lauren Janusz is an Occupational Therapist and the owner of Brandywine Occupational Therapy LLC in Wilmington DE. The practice offers school based and outpatient OT. 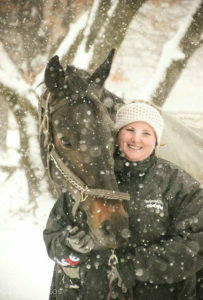 Since 2012 she has been a Board Certified Clinical Specialist in Hippotherapy. 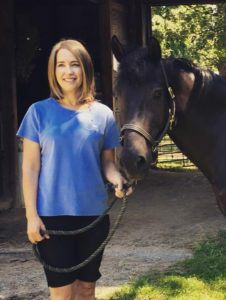 She is an active member in the Delaware Occupational Therapy Association and a recent appointee to the Board of Directors of the American Hippotherapy Association, Inc. She is a volunteer equestrian, skiing and soccer coach with the Special Olympics Delaware. She enjoys being outdoors with her family when not at work. Brooke Zuvich graduated from Del Tech in 2013 with her Associate’s degree in Occupational therapy. She recently graduated from Wilmington University with her Bachelor’s degree in Allied Health. She plans on getting her Master’s degree in Occupational therapy. Brooke has worked and volunteered with children with special needs over the last 10 years and has helped to run programs like TopSoccer and Camp Manntio. Brooke works in a SNF as well as Brandywine Occupational Therapy LLC. She loves to ride horses and spends as much of her free time outside as much as possible.